Qtopia Core applications write directly to the framebuffer, eliminating the need for the X Window System and saving memory. 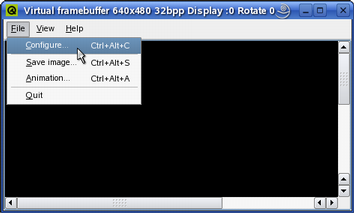 For development and debugging purposes, a virtual framebuffer can be used, allowing Qtopia Core programs to be developed on a desktop machine, without switching between consoles and X11. 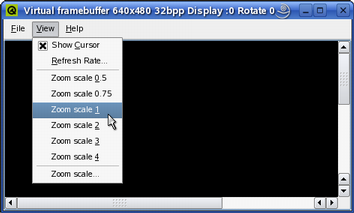 Please note that the virtual framebuffer is a development tool only. 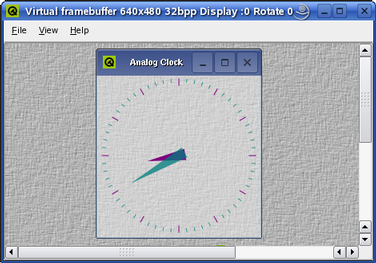 No security issues have been considered in the virtual framebuffer design. It should be avoided in a production environment, i.e. do not configure production libraries with the -qvfb option. -qwsdisplay <:id> The Qtopia Core display ID (default: 0). 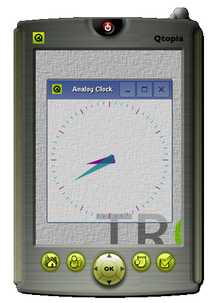 Note that a skin can have buttons which (when clicked) send signals to the Qtopia application running inside the virtual framebuffer, just as would happen on a real device. Note that the defaultbuttons.conf file is only necessary if the skin is supposed to be used with Qtopia (The file customizes the launch screen applications, orders the soft keys and provides input method hints). See the Qtopia documentation for more information. Warning: If qvfb is not running (or the current Qtopia Core configuration doesn't support it) and the driver is not explicitly specified, Qtopia Core will write to the real framebuffer and the X11 display will be corrupted.